This article is adapted from a presentation given by Jared Everett at the 2010 National Pavement Exposition. Customer service and sales go hand-in-hand, and this interview with Jared Everett will help you improve both. He is a veteran purchaser, as well as seller, of pavement-based services. Everett also has extensive knowledge about the latest technological outlets for promotion, such as Customer Relationship Management (CRM) software and marketing via the internet. Jared Everett has experience in sales for a paving and pavement maintenance contractor, as well as experience in purchasing pavement maintenance services for large public institutions. This unique combination allows him to instruct you in creating an effective sales approach that considers both sides of the sales proposition. In his 38-minute audio interview, Everett introduces and discusses a number of simple-to-use technology solutions designed to improve sales, service and communication. He talks about what factors to consider with your web presence, as well as the importance of quick turnaround on web inquiries. The basic difference between advertising and marketing is discussed and clarified. Everett also offers a number of 'do's and don'ts' to for prospect and customer contact, follow-up and proposal presentation. A detailed analysis is provided for ways to utilize CRM software to track customers more closely. Today's software allows developing closer relationships with customers, as well as with prospects, for that matter. Included are a number of tips and techniques as to how to use this type of software to best advantage. Everett additionally provides his take on the importance of sweeping and pavement businesses being involved in local organizations such as the Better Business Bureau, local Chambers of Commerce, BOMA, etc. Not only is there a movement toward using locally-involved businesses, but it is increasingly important to actually go to the meetings and to be involved with the local people in those organizations. Plus, you'll learn how to avoid what Everett calls "the top 10 mistakes" bidders make when responding to requests for proposals, and you'll learn how to include his "top 10 items public buyers of pavement maintenance services look for in proposals." Between our audio interview, in which we both offer ideas for 'next generation marketing,' and Everett's NPE seminar PDF file, you will gain insights that will help you improve your customer service, give your sales efforts more impact, and help more buyers make a commitment to your company. 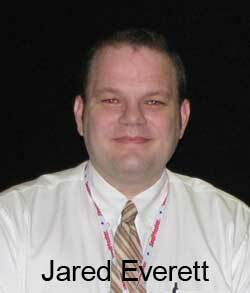 We also offer an audio interview on this topic area with Jared Everett. Note: The audio interview with Vitale will play without downloading any files onto your computer. If you hear the interview at 'chipmunk speed,' you will need to download the latest version of Adobe's free Flash player. To listen to Jared Everett's audio interview, click on this link or on the small triangle inside the circle you see to the left. If you have any trouble accessing the audio, please let us know. Jared Everett heads up Everett Professional Services, LLC, which is based in Boise, Idaho, and also has offices in Phoenix and Salt Lake City. He is also Executive Director of Finance and Planning at Boise State University. You may reach him via email sent to jared@everettservices.com, or by phoning 208-863-8379.